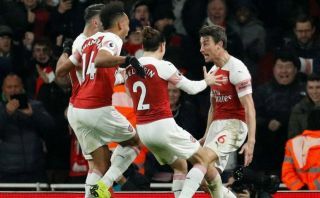 Arsenal defender Laurent Koscielny made a small piece of history with his goal in the 2-0 win over Chelsea in yesterday’s Premier League clash at the Emirates Stadium. The Frenchman has always had a decent scoring record from the back, and according to Opta Joe, his strike against the Blues was his 20th top flight goal for the Gunners – more than any other defender has scored for them in the competition. That’s a hugely impressive stat from Koscielny, who looks to be getting back to his best for Arsenal after a long time out injured. At the age of 33, some will no doubt have questioned if the former Lorient man could ever truly get back to his best at this level, but he clearly remains an important part of this team. On top of his own personal record, Koscielny’s goal helped secure a result that also illustrated Arsenal’s progress under Unai Emery this season. According to Opta Joe, the Spanish tactician has now picked up eight points from games against the big six – more than Arsene Wenger managed in his final season in charge.